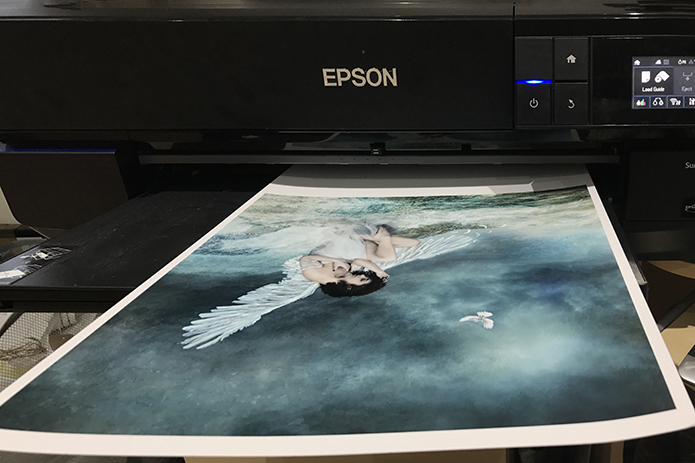 I never tire of watching the picture appear from the deep dark depths of my printer……. except when it comes out completely magenta ! How the ecstasy can turn into hours of agony when you try and rectify the problem and you can’t find the solution. That was yesterday and after a sleepless night I had yet another go this morning… my world still had a rosy glow… but not in a good way. I came to the conclusion that I would have to buy another printer but in the meantime I ordered some more of my lovely Permajet paper and mentioned my predicament to the chap on the other end of the line. Quick as a flash I was put through to a lovely fella who gave me some sound advice and he said that I should follow the link he gave me because the driver download I was using (series 2) was apparently an Apple Generic Driver which overrode the Epson driver I needed . So I took him at his word, downloaded the new driver and hey presto my world is the right colour again……. very green, but that’s JUST the way I want it. So now I sit here (writing this blog) listening to the printer happily whir away printing my pictures to exactly the right colours that I wanted them to be. This entry was posted in Blog, Photoshop, Portraits and tagged creative images, Digital Art, Digital Painting, Photoshop, photoshop manipulations, printing. Bookmark the permalink. Printing is such fun (when all goes well!) Hell when it doesn’t.